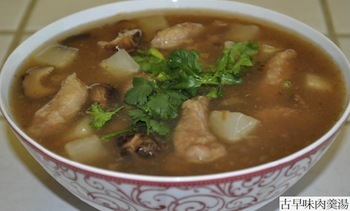 Pork pottage, known also as Rou-Geng, is a traditional Taiwanese delicacy that can often be found at Taiwanese night markets or daytime bazaars. Usually there are two versions of Rou-Geng: one that uses sweet potato powder and another that uses fish paste. In this recipe, we create Taiwanese pork pottage with sweet potato powder instead of fish paste, since sweet potato powder is an easier ingredient to find at American supermarkets. Marinate pork strips with 1 Tbsp. of soy sauce and ¼ tsp of sesame oil for 30 minutes. Add sweet potato powder to coat around pork strips. Place daikon cubes, mushroom strips and water into a pot, and cook over medium-high temperature until daikon turns soft. It takes about 10 minutes. Add soup seasonings into pot, and then pour in tapioca water, stir constantly while pouring. Turn the heat to medium-low. Put pork strips into the pottage, cook until the pork strips float on the top and bring the soup to a boil. Serve pottage with deep bowl and garnish with cilantro. This recipe can made with other vegetables, such as bamboo strips or cabbage strips. You can also use fish paste to coat the pork strips instead of sweet potato powder. Some people like adding noodle to the pottage and then serving the dish as a meal.